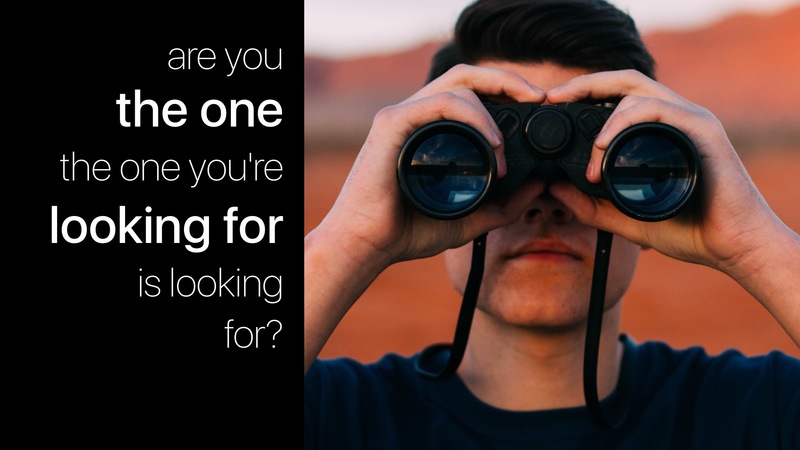 are you the one the one you’re looking for is looking for? It’s the stuff of magazine and online quizzes and random questions from well-meaning people at church. What’s on your list? In your ‘quest’ for a partner, what are you looking for? Inevitably this leads to speculation about whether one is too ‘picky’ or not. Matched by another’s assertion to ‘not settle’ because you ‘deserve a good one’ (as opposed to the others who clearly don’t?). Unfortunately, the narrative around prospective dating or marriage relationships can be intensely focused on what an individual WANTS from or in a partner. We probe others about their preference or tease them about the ‘kind of girl/guy they like’. I’ve lost count of the number of people who’ve asked me to give some sort of list or description of the guy I’m ‘looking for’. When you imagine the kind of guy YOU would want, and then you imagine the kind of girl that guy would want, are you that kind of girl? If you think of the type of girl you would want to marry and envisage the type of guy she would be looking for, are you that guy? To personalise it, the kind of guy that I would want to marry would want to marry a girl who was strong in her faith, growing in her walk with God, refining her character through submission to the Holy Spirit and wise counsel, sure in her sense of self, a person who apologises and forgives, a person who loves her family and friends, someone who is generous and open-hearted. Because if they didn’t want to marry that kind of girl, then they probably are not the kind of guy that I would want to marry. And so it follows, that if they’re the kind of guy that I would want to marry, then I need to be exactly that kind of girl. It sounds like linguistic gymnastics but the shift in focus is profound. Relationships and marriages that work and flourish are others focused. They are made up of two people who are intent on being their best, giving their best and helping the other to be their best. When it comes to considering our future partner, given that we most likely have little knowledge of if or who that actually is, the only activity we can do to impact the potential outcome of a prospective relationship is to ensure that we are growing into the best version of ourselves. Of course, the upside of this is that we become the best version of ourselves! Not just FOR a partner, but because the best version of ourselves is exactly who we ought to be striving to be. We benefit from constant growth and development and the fact that a future partner might benefit also, is just a bonus! Bit of a tongue twister actually!